After reading and reading again about the combat at Klausen I decided to create a small Scenario. I didn't include the whole Imperial and French army because they didn't fight there. 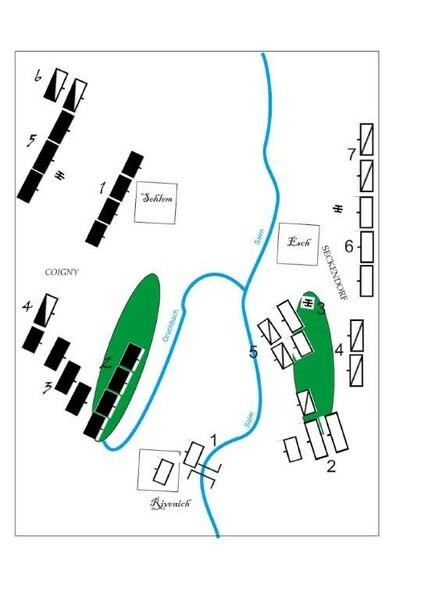 The main fightings were at Rivenich, although the French center suffered some losses near Esch too. I included some French and Imperial troops as a option for a bigger battle. These Units got dithering commanders to reflect that they didn't fought in the real battle. 3 Brigadier marquis de Rambures (Dep.) : Brigade Navarre : 3 x inf. Looks very interesting! I read the battle in Wikipedia, it a small battle, but as you included your options, it may become a big one on table! I recognized several contemporary maps. Most of them show the French grenadiers as one line and are more or less confusing. Therefore I prefered to use the Austrian account which is highly plausible except Waldeck's final move to recapture the bridge at Rivenich. The Austrian book mentions that he set out at Esch, crossed the Salm and attacked the left flank of the French. However the French hold the line from Hetzerath to Sehlem and Sehlem lies a bit North of Esch. Maybe the French grenadiers under Philippes occupied Rivenich alone and were isolated when Waldeck attacked. Yes, most probably as you say. I found some more maps, which were even more confusing and most probably inaccurate. If usefull or not, I very much enjoy such sources. Thank you for this. The text is about skirmishes around Speyer. Brigadier Kleinholtz (or Kleinholz) surrounded a troop of 300 Prussian hussars, who had raided a French supply train. The fighting was unbalanced because Brigadier Kleinholz had 3.000 men. But the Prussians had a fighting escape, loosing 30 hussars dead or wounded. The author mentions rumors about the duke of Richelieu who lost a lot of money at the gaming table in Mannheim. Certainly I will use my British redcoats except the flag. It's interesting that such a large army had so little artillery. The hussars were not recognized as battle cavalry but formed the reserve. Some names like Rutowski and Diemar are too famous to be unnoticed. The spelling of many generals is strange. Please ask if you have any questions about it. I'm looking for the OdB of the French army.